Huntington Ingalls Industries (NYSE: HII) has secured a potential $1.46 billion contract modification to design and construct a 12th San Antonio-class amphibious transport dock for the U.S. Navy. 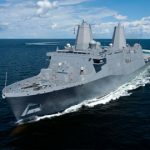 The Defense Department said Monday it expects Huntington Ingalls to complete detail design and construction work on USS Fort Lauderdale (LPD 28) by October 2021. The Naval Sea Systems Command will obligate $1.2 billion in fiscal 2015 and fiscal 2016 Navy shipbuilding and conversion funds at the time of award of the modification. Amphibious transport dock ships, also called LPDs, are designed to embark, land and transport elements of a landing force, equipment and supplies for expeditionary warfare, amphibious assault and special operations support missions. DoD noted contract work will occur in Georgia, Mississippi, Virginia, Wisconsin and various other sites in the U.S.
Huntington Ingalls said Monday LPD 28 was named after the city in Florida which holds historic ties with the service branch since 1830.